GOLF IS MADE OF MAGICAL MOMENTS! For over two decades "Pro Tony" has built a proven and successful record of excellence in golf instruction in Thailand and throughout Southeast Asia. 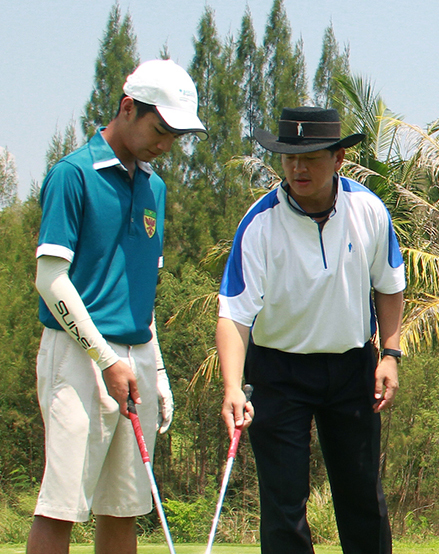 Combining 5-Star services with simple effective golf instruction, Tony 'Black Hat' Meechai's golf improvement programs are as unique and diverse as the countries of Southeast Asia. The Black Hat magical approach provides players with a holistic integration of improvement in swing dynamics, golf fitness and mental toughness. All these components make up The Multi-Discipline Platform (MDP) Curriculum™, which is guided and continually evolving under the guidance of Award Winning PGA of America Professional Tony Meechai. The teachings have been highly successful for many golfers visiting the Kingdom of Thailand. Golfers from around the world have continually praised Black Hat magical approach for its simplicity! “Experience The Magic of Golf” learning programs not only cater to the residents of Thailand, but for those traveling golfers from overseas. For complete beginners, these programs allow them the chance to try something completely new for as little as a half-day to five-day programs. is one of the greatest vacation destinations in the world. With superb golf courses, top-quality accommodation, reasonable prices and world-class coaching, Thailand has simply become the preferred place in Asia to learn and improve one’s golf game! Visitors to the Kingdom can now have the opportunity to “Experience The Magic of Golf” in a fun learning environment with vacation golf schools! PGA of America Professional Tony Meechai has perfected the vacation golf schools program to fulfill the needs for tourists to the Kingdom and golfers wanting to improve their game. These are great programs for all skill levels, including couples on vacation and wanting to learn how to play golf together! The Black Hat Way is to communicate simple and effective golf instruction so that it is specific to the student's goals. Ultimately, the student must obtain a level of confidence through an authentic experience in improvement and development so he or she can continue to strive to be the best can be – both in golf and in life! At Black Hat, the coaching philosophy is very simple and based on Club-Focused Instruction principle. The approach is for the golfer to have a trust for their swing so that it produces a controllable ball flight! © 2019 Black Hat Golf. All Rights Reserved.